The experiences of other traders, be they famous or not, are always of interest to both novice and advanced traders. The NanoTrader contains an abundance of tools, chart patterns, signals and trading strategies used by (not so) famous traders. All are clearly explained and ready-to-use. You can even modify them, if you want. 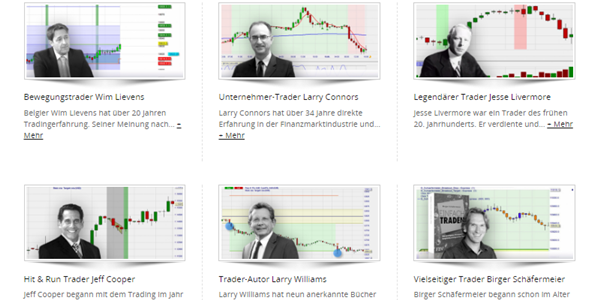 Access a treasure trove of famous trader tools and strategies. Every tool and strategy is clearly explained. All tools and strategies can be modified. Every client has a permanent free real-time demo for testing purposes. The strategies can be traded (semi-)automatically. The majority of tools and strategies are free. The following traders have one or more tools, strategies, signals, SignalRadar tables... in the NanoTrader platform. This trading platform is simply genious. You can immediately use it efficiently. The product range is also exceptional. The support is competent, friendly and fast. I could go on for hours listing positive elements. Really, first class. Please, continue in the same vain.